After a gorgeous day at the beach in Whitstable, Luke and I woke up this past Sunday morning with another beautiful day. That happens like once every five years in Britain... for BOTH weekend days to be beautiful. So after having jogged that morning and then showering, I changed back into workout clothes to go out for a light hike through Hampstead Heath. Hampstead Heath is located in northwest London between the northern line split. We visited the heath during the summer last year, but only went to plop down on the grass to read, so we didn't do much exploring. We had a different plan this time though. From Belsize Park station, we entered the heath and began walking north. We immediately felt like we were in the country. Wide open grass. Massive trees for climbing. Dirt pathways. Forest and streams. Small slopes, Fishing ponds. And of course, no cell service. For the majority of the time so far, we had been climbing uphill. 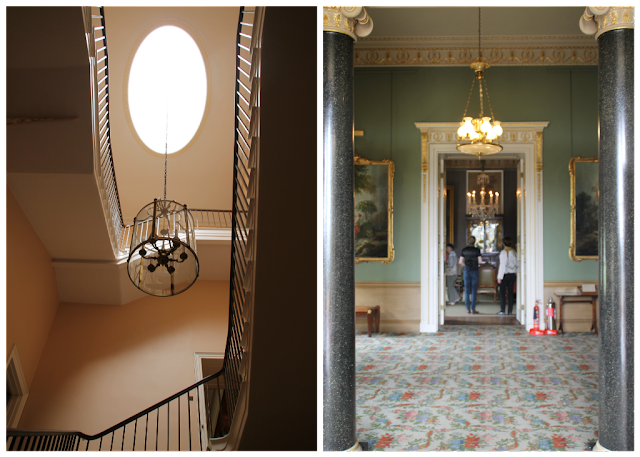 But we eventually reached Kenwood House, which has been on my list of "secret spots in London" list for a while. We decided to take a look inside as it is free entry... and a free loo. It was a beautiful home that reminded us very much of a southern plantation home. It was not overly decorated which made it feel like an actual home rather than some palace. Kenwood House was originally built in the early 17th century, and was opened to the public in 1928. Around the side of the house (the eastern side) was a hill with a nice view of London. We sat for a few minutes to enjoy the view before we moved along down hill. Further along south was a pretty unique aspect to, not only Hampstead Heath, but London - swimming ponds. There was a pond for the ladies and a pond for the men. The ladies pond was pretty closed off, but we could hear the squeals from girls in the water (seriously, it sounded like the Parent Trap camp), but the men's was visible from the outside. I think it would be fun to check it out one day! After the ponds, we came upon Parliament Hill, so there we went, back uphill again. This is one of the best views of London! It helped to have a sunny day, though. There were so many people all over the heath, but not overwhelming because the heath is so large. Families were out for walks, kids were learning to ride their bikes, ice cream trucks pulled up for a snack, and of course, boozey Sunday picnics. But my most favorite activity I saw was kite flying! For almost 2.5 years, I have been so confused as to why no one ever flies kites in the park. I mean this is London, where Burt (from Mary Poppins) sold kites! "Let's. Go. Fly. A kite!" The only thing I can think is that it is an illegal activity in most parks - you know, health & safety. So it got me very excited when I saw kites in the air - Luke might have described me as sounding like one of those squealing girls from the pond. 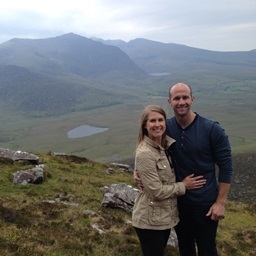 I do miss all the walking we used to do in Scotland, but this was a pretty great alternative! In the end, we probably do about 6 miles or so - not too shabby. Who knew one could hike in London? 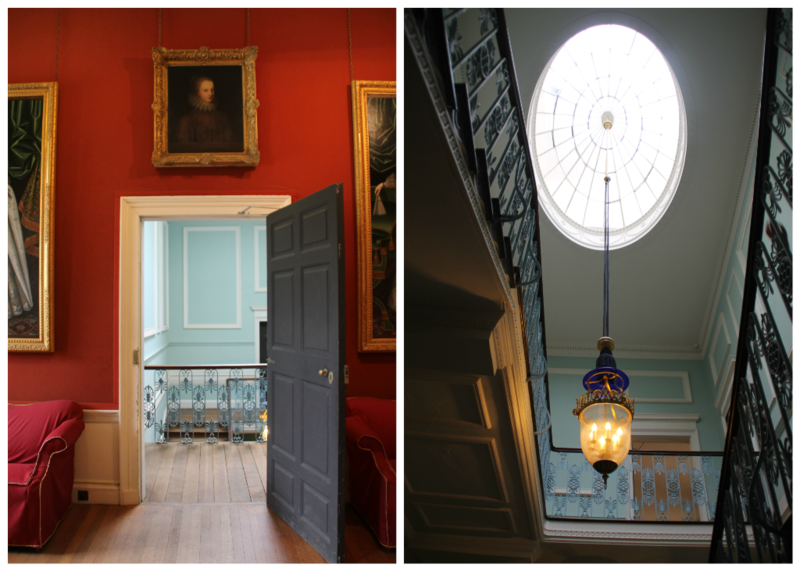 Kenwood House was featured in the film Notting Hill.